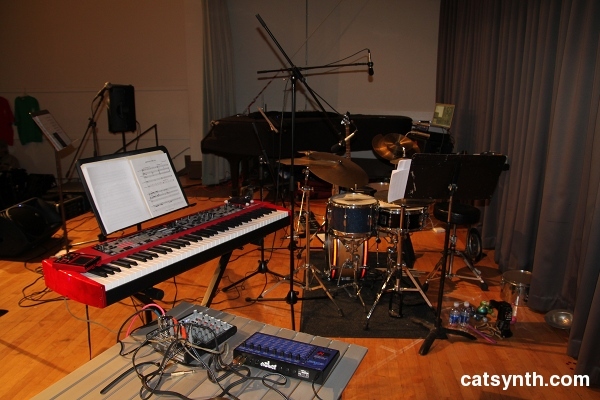 Today we at CatSynth conclude our series from the recent Outsound Music Summit with my own report from the MultiVox program that featured Reconnaissance Fly, the Cornelius Cardew Choir, and Amy X Neuburg. We did feature a guest review by Joe McMahon last week, which covers the same show from an outside perspective. My own perspective is anything but outside, given that I was in two of the three groups performing at night. The Evolver was actually for the Cardew Choir, but I set up everything at once. 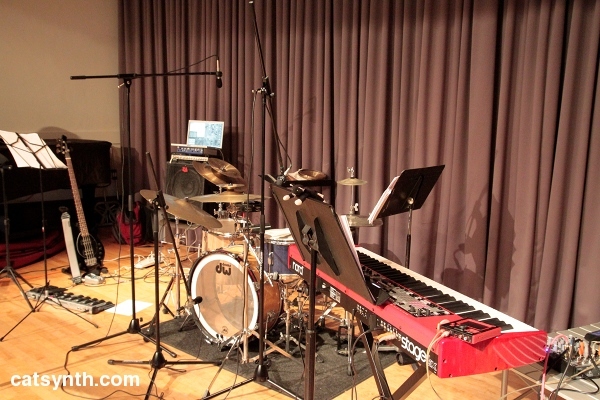 One can also see Moe!’s toys and other support percussion instruments. Onto the show itself. 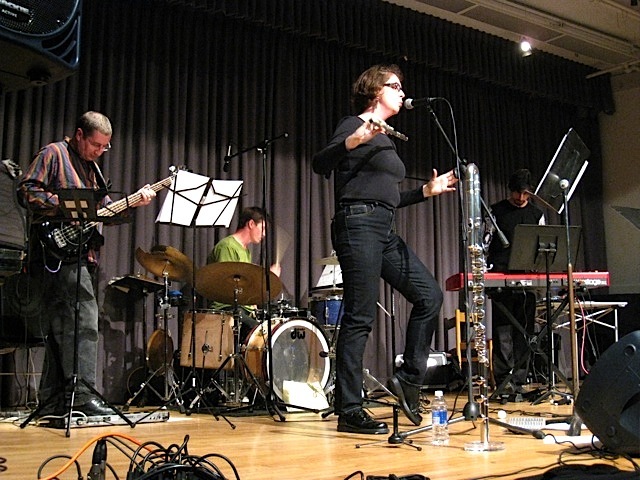 Here is the full band on stage, with myself, Polly Moller (flute/vocals), Tim Walters (bass), Moe! Staiano as our special guest “concussionist”. We performed a full nine-piece set from Flower Futures, our “spong cycle” featuring music set to spam poetry. The set now has an eclectic mix of styles, from experimental avant-garde to prog rock, along with latin and jazz influences. We as always with Small Chinese Gong and ended with An Empty Rectangle – we always like playing that last one, but it’s even better with Moe!’s drums! 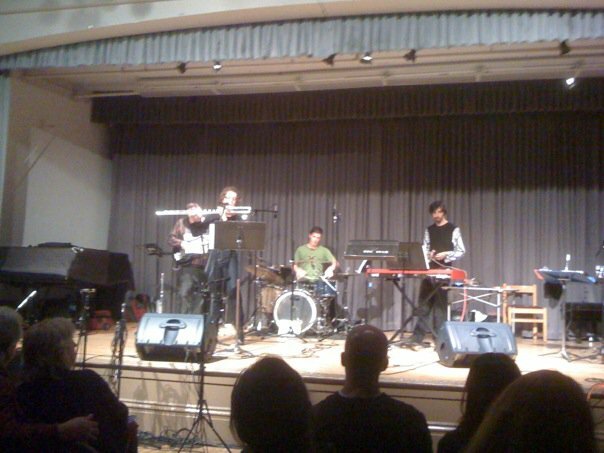 I particularly enjoyed playing the medley of Electric Rock Like a Cat and Sanse is Credenza – the end of the first piece, with free-improvisation on flute set against B-diminished chords, elides into an early 1970s jazz fusion jam on the same chord (think “Chameleon” from Herbie Hancock’s Head Hunters album). This is a relatively high-energy and somewhat challenging piece, and while it was fun to play, it also felt good to then return to the relative calmness of Oh Goldfinch Cage, which featured samples of “human calls” for training birds to speak, with phrases like “Hello, how are you?” and “pretty bird”, processed with ring modulation and turntable effects. Overall, it was a great performance with a lot of energy. 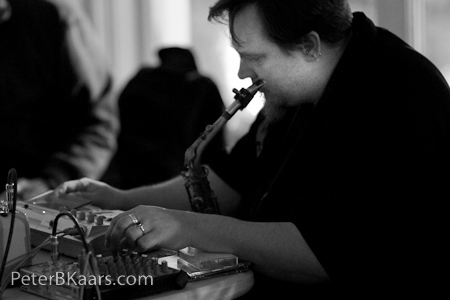 It’s easy to lose sight of that in the midst of playing, where one focuses on mistakes and challenges – personally, I forgot to check that patches for the Nord were all queued up at the start of the performance, and the heat from the lighting and large crowd added unexpected challenges. But it was received well by the audience (a full house), and it seemed like they were asking us for an encore! The Cornelius Cardew Choir was a stark contrast to Reconnaissance Fly in terms of form and energy. 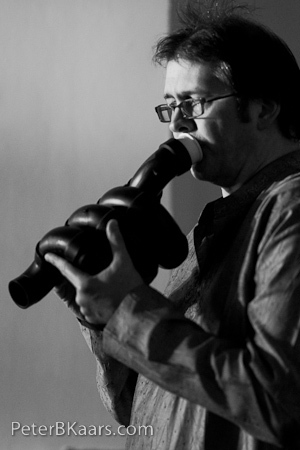 Our first piece, Joe Zitt’s “That Alphabet Thing” was a cappella with a freeform structure. Basically, it unfolds by each singer intoning the sounds of the letters of the alphabet, starting with A and gradually working his or her way to Z. Everyone moves at a separate pace but mindful of others not to get too far ahead or behind, and there were a lot of fun moments of interplay among different choir members, such as back-and-forth with “Hi!” for H-I or “why?” for Y. 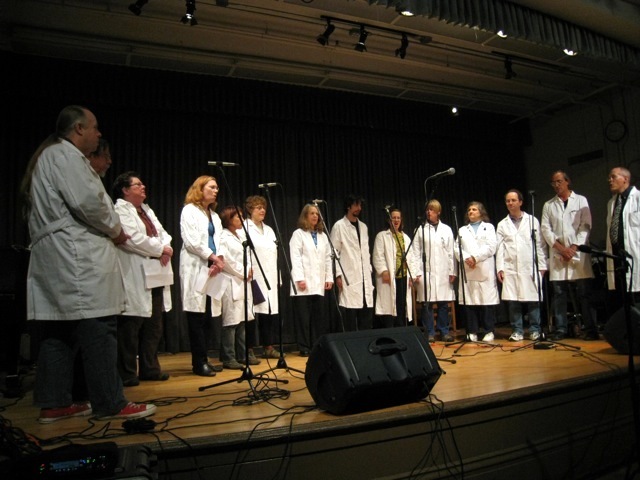 We wear white lab coats. This was followed by “El Morro” by choir director and co-founder Tom Bickley. The piece was inspired by a trip to the El Morro monument in New Mexico and featured the text from inscriptions on a rock spanning carved messages from two centuries of Spanish, Mexican and American passers by, soldiers as well as other travelers. Each of us had a set of inscriptions to recite on a single pitch per inscription, set against an electronic background of rocks, birds of prey and highly processed vocal incantations. This was a rather complex piece conceptually, though not difficult to perform. Because we were so involved in the performance and the conceptual nature, it is hard to know how it was received in the audience. 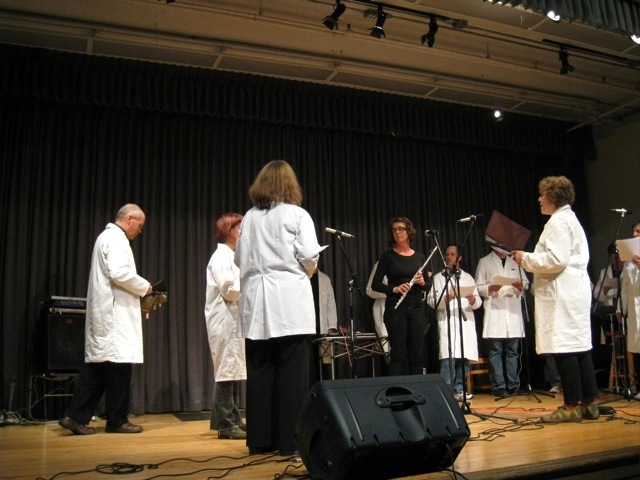 The set concluded with a performance of Polly Moller’s Genesis. We had seen a previous performance of Genesis at the Quickening Moon Concert. The previous performance was entirely instrumental. This time, the parts of the spatial and higher dimensions were voice. I performed part of “universal time”, using the sequencer on the Evolver as the time-keeper and performed various modulations of the tempo and timbre. 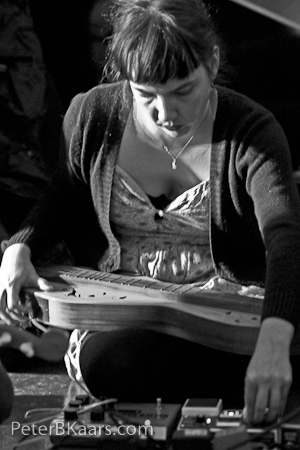 Polly played the role of the “new universe” with a flute solo featuring multiphonics and other techniques. Tom Bickley conducted the piece by walking around the stage and carrying chimes. This was a very meditative performance, with the chimes, the flute multiphonics, the ever changing electronic rhythm and timbre, and the vocalists singing their respective dimension numbers in different languages. The final set of the evening featured Amy X Neuburg. As always, her “avant cabaret” set was very polished and spoke well to both her technical expertise with her instruments and her versatility as a performer. She employs several styles of singing, often in a single piece, moving from classical to cabaret/jazz to experimental vocalizations. Her synchronization with looping electronics is very tight, seemlessly adding and subtracting samples and recordings within the rhythms and phrasings of the song. There were pieces familiar from past performances, such as “Life Stepped In” where she deftly mixes looping technology and theatrical vocals. 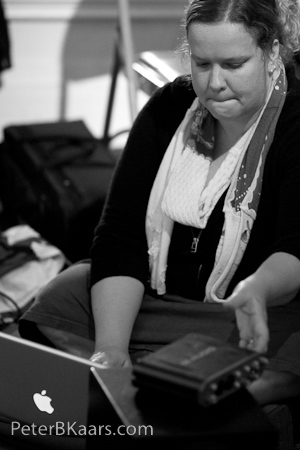 She also did a few improvisational pieces, the first of which featured the Blippo Box. 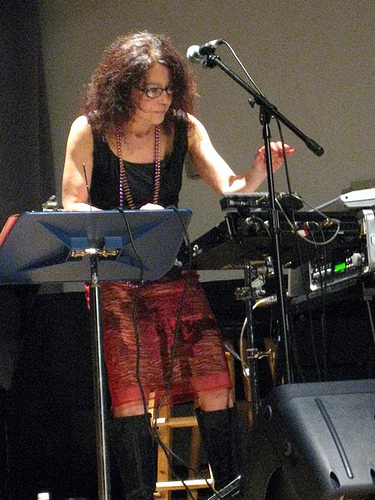 This is an instrument with chaotic oscillators that never quite sounds the same twice, but she always manages to control it quite well – in this performance she made it sound like a voice, to which she responded with her own voice. She also performed an improvisation with a Skatch Box which she made at the “build your own Skatch Box” presentation earlier in the week (and which I unfortunately missed). It’s hard to make a skatch box sound like a voice, but she could make her voice sound like the growls and scrapes that it produced. She ended her set with a tribute to Kim Flint, who was very active in the looping and electronic-music communities, and the founder of Loopers Delight, and who passed away after a tragic accident in Berkeley in June. He was someone I knew as well from both music and social events. 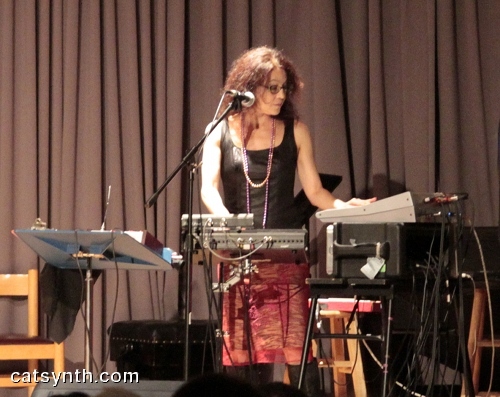 Amy’s tribute was a performance of the first piece she ever created using the Echoplex, which he co-invented. Last Thursday, I participated in another round of “Outsound Music Presents Conduct Your Own Orchestra Night”. 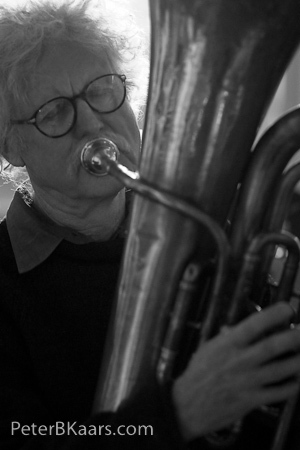 I played iPhone and Kaoss Pad in the “orchestra” along with Tom Bickley (recorder), John Hanes (percussion), Simon Hanes (bass), Carlos Jennings (synthesizers), Bob Marsh (guitar), Marianne McDonand (harp), Ann O’Rourke (percussion), and Rent Romus (saxophone). The event was organized by Matt Davignon. I also signed up once again for one of the slots as a conductor. I used my graphical symbols, giving different symbols to different musicians throughout the course of the 10-minute piece. Each performer interpreted the assigned symbols as he or she saw fit, while listening to what others were doing. Ann O’Rourke had her metal cat-shaped CD holder again, which as perfect for the “cat” symbol. I also added a lot of direct pitch instructions to this performance, i.e., having specific musicians play a “C” or an “E” for a period of time, to build up unisons and harmonies and provide more variety to the texture. I was actually quite happy with the range of sounds and musical phrasing that resulted. John Hanes conducted a rather minimal piece, where everyone was instructed to play only the pitch “F” (if one had a pitch-capable instrument) and eighth notes. Within this He built of a minimal texture with a fair amount of dynamic range by having people enter and exit on his cue. For his piece, Tom Bickley gave us the basic concept of choosing a number between 5 and 10, and then repeat a pattern of counting up to that number and sounding a short staccato note The results was a sparse pointed texture, with various clusterings and the different performers moved in and out of phase. In the middle of his piece, Bob Marsh added his voice and words, and gradually moved away from the stage towards the back of the room as the piece drew to a close. One issue that has become apparent is that my iPhone has performed far worse as a musical instrument since I upgraded to OS 4.0. It runs slow and some applications quit unexpectedly – this did happen once when I was cued for a solo note, leading to a somewhat amusing but somewhat embarrassing moment. Fortunately, for a small and friendly show like this it is easy to laugh off. 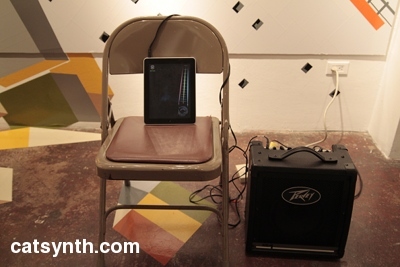 Last Thursday, I participated in Outsound Presents Conduct Your Own Orchestra Night at the Luggage Store Gallery. During the course of the evening, several conductors took turns conducting an “orchestra” of improvising musicians for ten minutes. Each conductor took a very different approach, using a variety of gestures, instructions and symbols to guide the performers. As with other recent guided-improvisation pieces, I used a graphical score for my conducting. 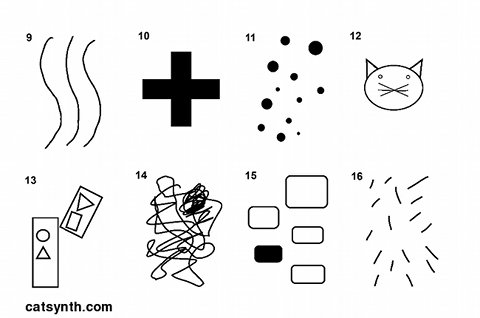 The performers were each given a set of 16 graphical symbols. During the course of the performance, I held up large cards each containing one of the symbols, directed either at individuals, groups or the ensemble as a whole. Ann O’Rourke’s piece was based entirely on pairings of words, such as “fearful/choppy” and “fearful/flowing” or “hesitant/slow” and “confident/fast”. The orchestra was divided in half, with one side receiving one pairing and the other side receiving the other pairing. Brandan Landis’ conducting was more physical/body-oriented. He did not use any visual cues (textual or graphical), but instead used dramatic body movements to guide the orchestra. Some of these were rather intense and the piece ended with his collapsing on the floor. 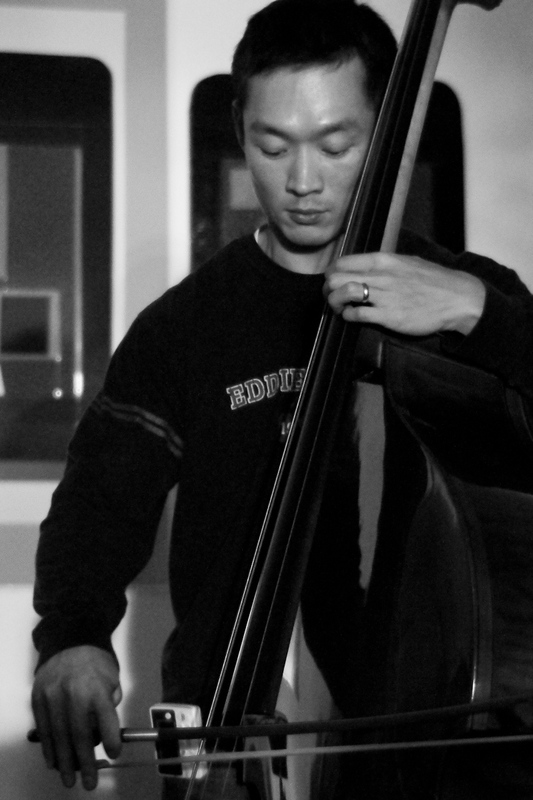 Mark Briggs used short rhythmic patterns and cues to individual performers to build up a complex rhythmic texture. I was given a very simple repeated pattern to perform, which allowed me to remain immersed in the overall rhythm of the piece. Tom Bickley led the orchestra in a very sparse and beautiful piece with individual sounds from cued performance set against silence. 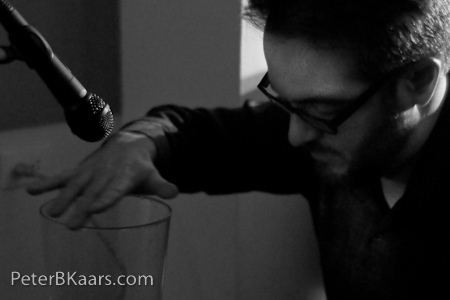 It was the sparse texture that made this among my favorite pieces of the evening, musically speaking. 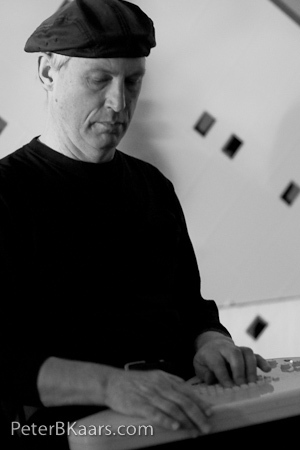 Bob Marsh used his own instructional cards and gestures to conduct the orchestra, and contributed his own vocal performance on top. Other conductors included CJ Borosque and Matt Davignon, who used a combination of instructional cards, including one that instructed a performer to make a loud sound when Matt pointed a finger gun and shot him/her.